We love Pancakes as I assume most people do. 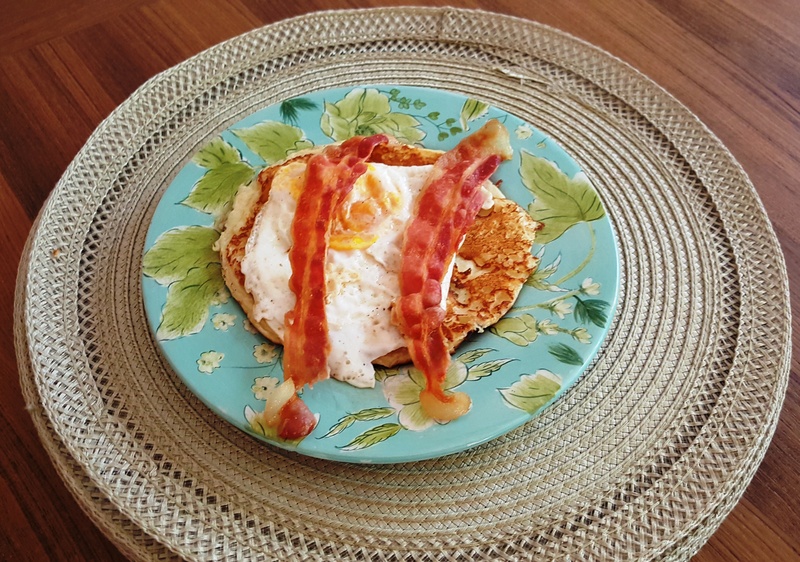 When I was cooking for 7 or 6 or 5 and so on – there were not usually any leftovers when I made Pancakes or Waffles. Now that we are only 2, making a small batch of Pancake or Waffle Batter is almost impossible and rather useless. You can always use the leftover Waffle Batter to make Pancakes or more Waffles the following day or two and you can always use the leftover Pancake Batter for more Pancakes. Unless you make your Pancake Batter somewhat thick, you’d better not use it for Waffles the next day. I like my Pancakes on the thin and light side, so the leftover batter does not do well in the waffle iron. So this morning for Breakfast, I took yesterday’s leftover Pancake Batter and made Pancakes and Eggs with it. A very simple thing to do. I used my Omelet Pan and made two Pancakes, one for my Husband and one for myself. 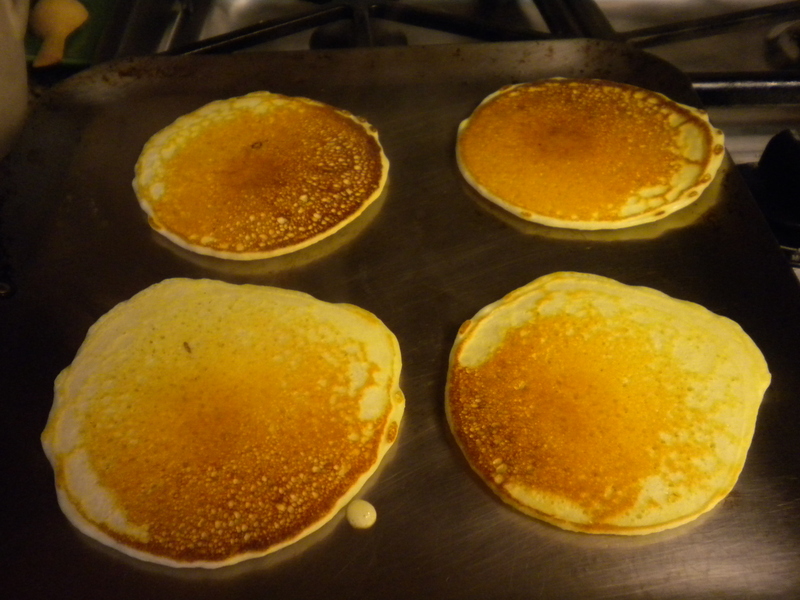 Next I made Easy-Over Eggs and put one on top of each Pancake. Add a couple of strips of Bacon, a glass of Juice and a cup of Coffee or a glass of Milk and Voila, you have Breakfast. Easy, Simple and Fast and no wasted Pancake Batter. The Pancakes take the place of Bread. Very simple, like 1 – 2 – 3 and you are done! September 26th is ‘National Pancake Day’. I do not know of anyone who does not like Pancakes. Pancakes are an exceptional food and can be made for any meal of the day or just for dessert. Pancakes can be found in many varieties around the world and they are not just made from wheat products. 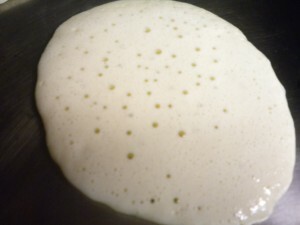 Pancakes may be made from Vegetables or Fruit. If you know the basic formula for making good pancakes, you can just about make them from any of the ingredients you may have in your pantry or refrigerator. Pancakes normally eaten for breakfast can be made with All-Purpose Flour, Whole Wheat Flour, Buckwheat Flour or even Cornmeal. There are almost always Eggs in Pancakes and in fact, the more Eggs in the recipe, the lighter and thinner your pancakes will be. 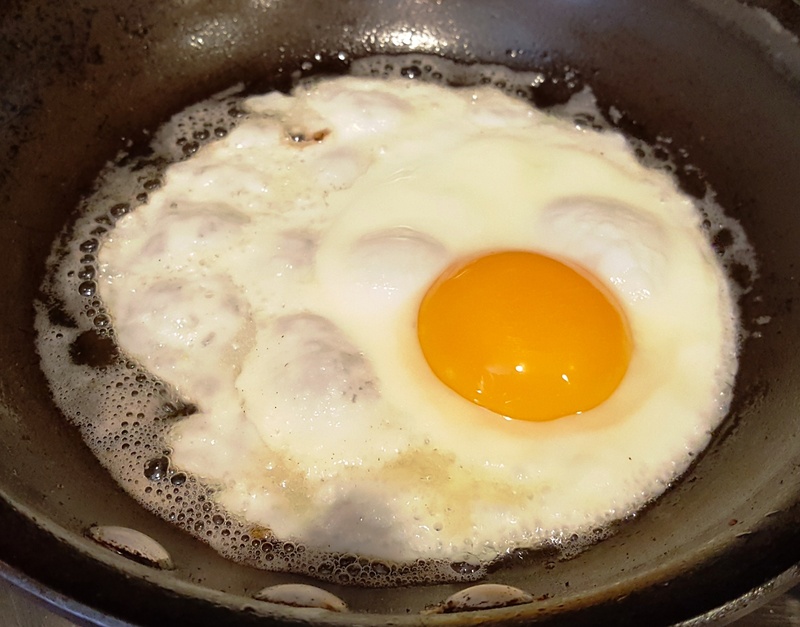 In addition to Eggs, there should be some liquid which is usually in the form of a Milk product. Buttermilk is popularly used for pancakes as not only does it provide flavor but helps to make your pancakes lighter and fluffier. If you do not have Buttermilk, but do have Sour Cream, that can be used also. To make a facsimile of Buttermilk just add 2 Tablespoons of Lemon Juice to your measuring cup before adding your milk product. After putting in the Lemon Juice, then add the milk and let it stand for a few minutes. The Lemon Juice will add some tartness to the milk and actually make it curdle, thereby giving you the effect of Buttermilk. I have even used Cottage Cheese or Cream Cheese in my Pancakes. In the case of the last two ingredients you may have to use additional eggs or even add some water to get the consistency you will want for your pancakes. If you have fruit that is getting too ripe to eat, you can mash it up and put that in your pancakes. Bananas or Apples are especially good for this purpose. While you are making up the Batter, begin heating your griddle over low heat. To make the Batter follow the general directions below. 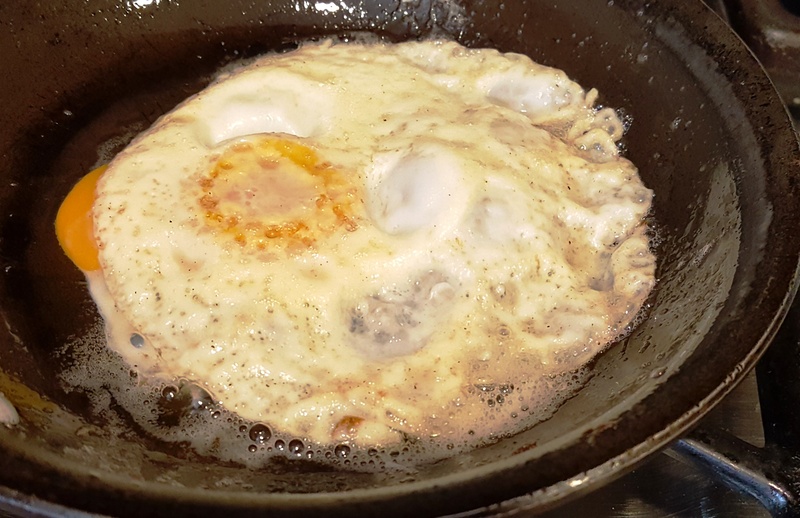 Whip up the Eggs and then add your Milk Product. If you are adding fruit, this the time to add them is right after the Milk. Just stir in the fruit. Combine the Dry Ingredients and add, stirring only to combine the ingredients. Next, stir in the melted Butter or Oil. Turn the heat up on your griddle. Your griddle will be hot enough when a drop of water will sizzle upon contact with the surface of the griddle. Rub a thin layer of Butter on the griddle (this will be for the first batch only) or use a Vegetable Spray. Then ladle or pour your batter onto the hot griddle. For he-man size pancakes, use up to a whole cup of Batter and cook just one at a time. For smaller pancakes, use anywhere from ¼ cup to 1/3 cups of Batter. Once bubbles form on the surface and the edges begin to dry, then it will be time to turn them over and cook the other side. The second side will cook considerably faster than the first one. 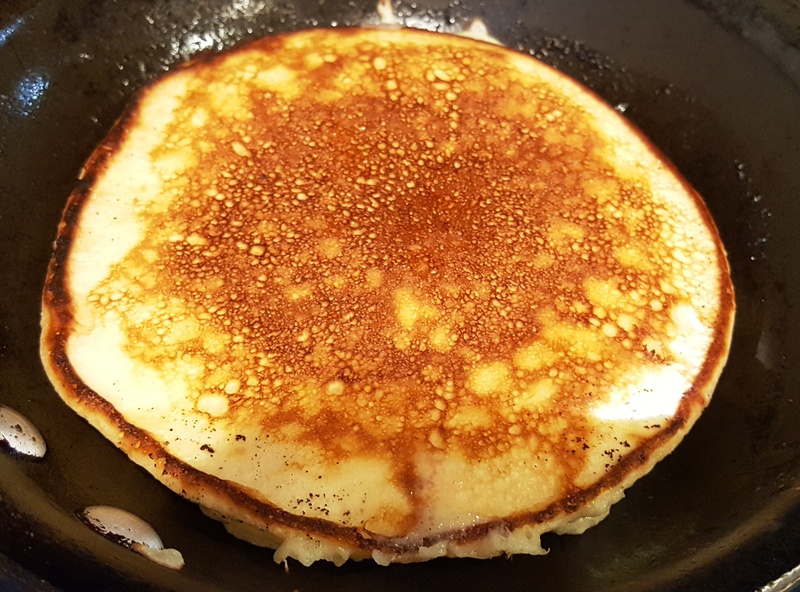 If you like your pancakes thinner than the first batch turns out, add a little more milk or if you like them thicker, stir in a little more flour. If you are feeding a crowd, turn the oven to 250 degrees and put your pancakes on a shallow baking sheet as you make and keep warm in the oven until time to serve. 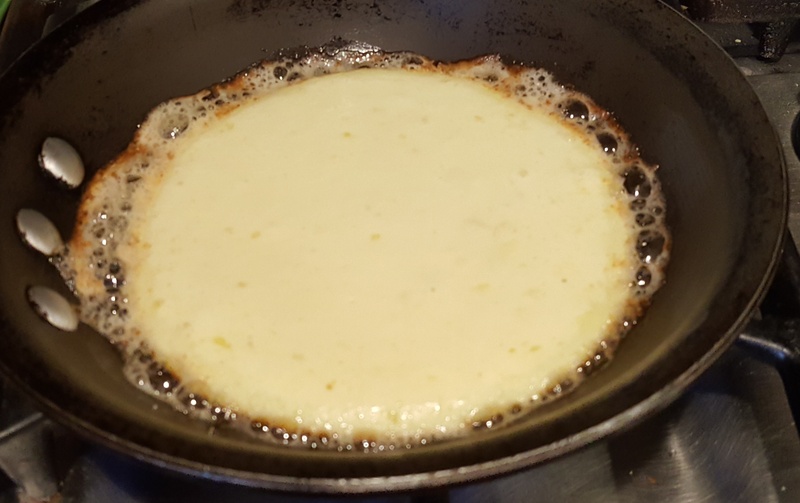 Serve your pancake with melted Butter and Hot Syrup. There are many types of Syrup that can be used, however Maple seems to be the most popular in the US. Other syrups that are available are Apple Syrup or Berry Syrup. In Hawaii you can also get Pineapple or Coconut Syrup. Caramelized Fruit is also a nice accompaniment to Pancakes. Fruit that can easily be Caramelized is Apple, Banana, Mango, Papaya. Berries can be sliced, sugared and served with Pancakes also or they can be turned into a Sauce by cooking them with a little sugar and a dash of Lemon Juice. Whichever way you like your pancakes, do enjoy them! Most people think of Sourdough as a Sour dough French Bread and yes, it can be. Sourdough can be traced back time many thousands of years and and as with many discoveries and innovations, it was most likely by accident that our ancestors figured out what to do with it. Sourdough is a bread made from a fermented yeast mixture. Sourdough can be saved from one bread making day to the next. Those bakers who have a special sourdough starter, baby it and take good of it, feeding it almost every day to keep it ‘alive’. The Goldminer’s during Gold Rush Days kept their sourdough in special packets and used it on a daily basis to make their breadstuffs. You can make your own Sourdough by combining Flour and Warm Water and leaving it out in a warm place uncovered so that it can catch the wild yeast in the air. And yes, there is yeast in the air, although if you leave your starter near an open window, it will ferment faster. You can purchase a Sourdough Starter from on-line sources along with directions on how to use it and preserve it. If you don’t wish to make your own sourdough and breadstuffs, you can just go down to the market and purchase a loaf of sourdough. Or go to San Francisco and buy some of their famous Sourdough Bread. In addition to bread, Sourdough can be used for pancakes and waffles and biscuits and muffins. Since April is National Sourdough Day, you may want to think of ways that you can use Sourdough in your family’s meal. Many restaurants serve Clam Chowder or Chili in small Sourdough Bowls which you can purchase at some bakeries or markets. Try the recipe below for Sourdough Starter. It can be used for Pancakes or Bread. You actually don’t need a recipe for bread; you just have to get the right proportion of ingredients (yeast/liquid) to achieve a nice soft and elastic dough. Combine the all the Ingredients in a glass bowl; cover with cheese cloth and allow to sit at room temperature for at least 3 days. 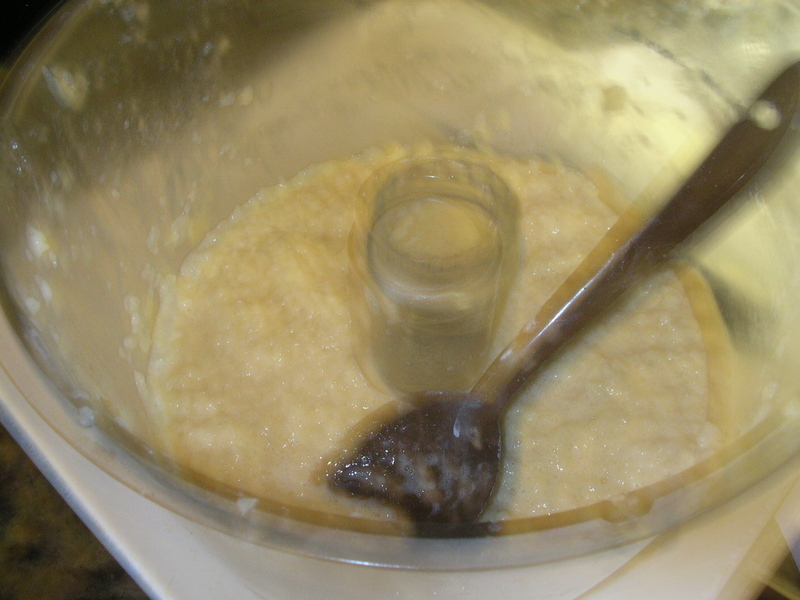 Remove the starter from the refrigerator and measure out the amount of starter called for in the recipe. Set this in a warm 85 degree spot for 1 hour. Add enough warm water and All-Purpose Flour in equal parts to the remaining starter to bring it back up to its original level in its storage container. Stir it well and return it to the refrigerator. If the recipe calls for more than half of your starter and you desire to use the starter within the next week, it is recommended that the replenished starter be placed in a warm 85 degree spot for 8 to 12 hours before returning it to the refrigerator in order to restore its strength. It is time for the Winter Holidays which include Chanukah, Christmas and New Years. Chanukah usually falls before Christmas and is celebrated by Jewish families around the world. It commemorates the rededication of the Holy Temple in Jerusalem at the time of the Maccabean Revolt of the 2nd century BCE. When the Maccabeans recovered the temple from the Syrians, an oil lamp was lit to rededicate the temple. The oil that was found was only enough to last for one day, but miraculously it lasted for eight days and nights. Hence, Chanukah is celebrated for eight days, with the lighting of one candle the first day and one additional one for each of the succeeding days. The total number of candles in all on a Menorah, the candelabra which is used at Chanukah, is nine. The ninth one is called the Shamus and is used to light the other candles. Because oil is involved with the rededication of the temple, foods that are traditionally served at Chanukah are often fried. These include Latkes (Potato Pancakes) and Jelly Doughnuts. 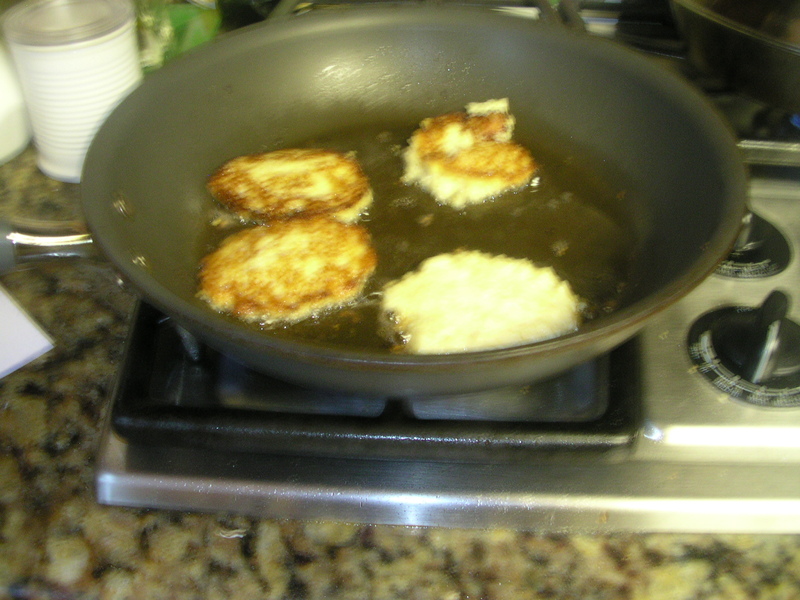 Latkes are usually made from white Potatoes (Russets are best) but in recent times they have also been made from sweet potatoes, zucchini, and even cheese. Latkes are traditionally served with Sour Cream or Apple Sauce. Recently, for a change I tried making the Latkes with Apples. 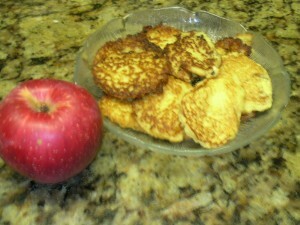 Apple Latkes do not need Apple Sauce to be eaten with them, but they are good with Cinnamon Sugar or Whipped Cream. They can be served as an accompaniment to a meat dish or they can be served for dessert or even for breakfast. When making Potato or Apple Latkes, you want to be sure to squeeze out all the excess moisture from the grated potato or apple. 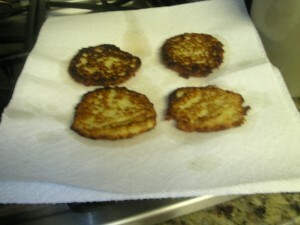 If they are too wet, the latke will not hold together when frying. Potatoes and Apples, like people, can vary. Some may have a lot of moisture and others may be dry. You will have to gauge it for yourself after the fruit is shredded. The apples on our tree do not have a lot of water and therefore, there was none to squeeze out. But the riper the fruit gets, the more moisture that is released from the cells so you just have to judge the water content by feel and look. Whether or not you celebrate Chanukah, try the Apple Latkes for yourself. They make an excellent side dish or breakfast item and are a good way to use excess apples. 1. Peel and core the Apples and scrub the Zucchini. 2. Shred the Apples and Zucchini using the small holes on a hand grater. Cut the Apples into 4 pieces. Attach a fine shredding blade to the Processor. Feed the Apples through the small feed tube until they are all shredded. 4. Shred the Zucchini in the same way. 5. Add the remaining ingredients to the Apple and Zucchini; mix well. 6. Fill a large skillet with 1” of Vegetable Oil and heat until hot. 8. Drain on paper towels or brown paper.